VILLAGERS are celebrating after a scheme to build a residential care home in leafy Hampton-in-Arden was blocked by a Government planning inspector. A Warwick-based developer, Sandstone Group, had proposed demolishing two houses and building a 64-bed nursing facility on the corner of Old Station Road and Meriden Road. Solihull Council turned down the planning application, but Sandstone appealed against the decision and a public inquiry was held in Solihull early last month. Scores of Hampton residents turned out to protest against the proposed home, saying it was too big for the village and would be badly out of place. The inspector, Alan Wood, agreed with them, dismissing the appeal on the grounds that the development would damage the character and appearance of the surrounding area. Opposition to the care home scheme was led by the Hampton-in-Arden Society and local parish council. The society's chairman, Graham Juniper, said: "It's excellent news that the developer's appeal against planning refusal has been dismissed. 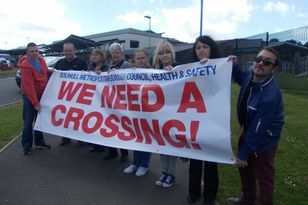 We are not against a care home being built in the village but this was the wrong location for it." A previous plan - by another developer - to build flats on the Old Station Road/Meriden Road site was also refused by the council. SOLIHULL Council is not bidding for Government cash to build permanent camps for gypsies and other travellers in the borough. HAMPTON-IN-ARDEN residents are gearing up for another battle to try to stop a large care home being built in the village.